Day 1: Flight from Philly to Rome. Day 2: Got into Rome, took the train to Rome Termini, then another train to Venice. The train ticket probably cost more than my flight. We were exhausted. 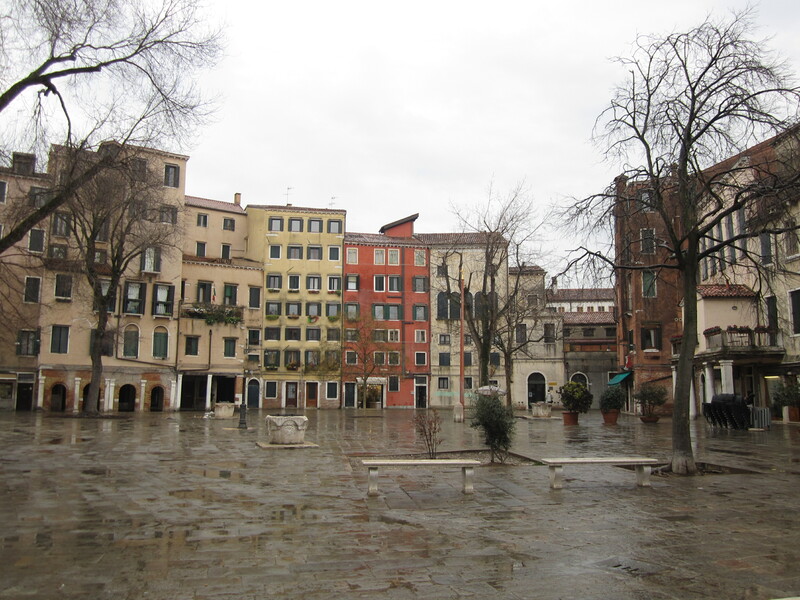 Got into Venice about 5 hours later and walked to our hotel, Ca’ Dogaressa, without much trouble. It was a beautiful room with 18th-century style décor. We got a cup of Tiramisu from the place next door and took a long nap. Went to get dinner. Rob was trying to find a place listed in Fodor’s, but as usual we couldn’t find it. We found another place though and it was some of the best food I’ve had in Italy. I got pasta Bolognese and polenta gnocchi. Rob got a fish and shellfish platter and a salmon gratinee. The restaurant was called Casin something but we couldn’t read the second word because it was written in some wacky art nouveau font. Day 3: The next day Rob couldn’t get up early enough so I had breakfast by myself downstairs – it was a small but nice breakfast, with juice, water, a hot drink, cereal, croissants, bread, nutella, jam, and yogurt. The owners of the place – an older man and his two kids? – are very nice. I took a walk around the Jewish Quarter, which was right next to the hotel. It was very peaceful and quiet. There was a Chabad house and a synagogue museum, and I saw some men praying. I went back to the hotel and got Rob and we made our way to St. Mark’s. It took about 25 minutes to walk there, especially since we kept getting lost. Spent a long time looking at the medieval mosaics in the atrium. Went inside and saw the pala d’oro, the treasury, and the museum where they have the original bronze horses. We also went out onto the roof and got a view of the piazza. Very impressive, even seeing it the second time. The whole time the weather was drizzly, but it didn’t rain much and I was very comfortable in my long coat. We had lunch in a pizza place near Piazza San Marco, which was very good. I got caught up looking at everything and we got to the Correr Museum as it was closing. We walked to the Accademia museum, which was in the neighborhood where our restaurant from last night was. The museum was nice but I felt like the paintings needed a good cleaning. They were all so dark. After that we weren’t very hungry, so we found a supermarket (1 of the 2 I’ve seen in Venice) and got some bread, cheese, fruit, etc., and had a picnic in our room. Day 4: We again left later than I wanted but after asking the hotel owner we found out that the vaporetto to the islands had a stop right outside the hotel. We bought a day pass from one of the tobacco shops (16 euros each, unlimited rides all day, as opposed to 6 euros a ride). It was nice seeing the island from the lagoon. I didn’t really want to stop at San Michele but Rob wanted to so we got off. It was interesting, with separate sections for nuns, priests, etc. There were 2 active funerals going on. I realized too late that I wasn’t supposed to take pictures (not that I took pictures of the funerals, but of the whole cemetery). We got back on the vaporetto and went to Murano. I was overwhelmed by all the glass stores around me. The island itself is like a miniature Venice. We went into some of the larger stores and got creeped out because the employees kept following us – probably to make sure we didn’t steal/ break anything. The glass here is amazing, of course, but most of it is very modern and I wanted to find more ‘traditional’ pieces. Also I was disappointed there were no good deals here, at the source of production. It’s just as expensive as you’d find anywhere else. I was determined to buy a piece of glass before I left Venice, though. They had glass sculptures on some of the side streets. I especially liked the one with glass ducks facing the lagoon. We went into the church on the main canal, which had some masterpieces inside. Then we went into the glass museum, which was kind of a rip off. It didn’t have much and the stores outside were much more exciting. Got back on the vaporetto to Burano. It took 15 to 20 minutes to reach Burano. You could see a lot of sand bars covered with birds in the distance. When we first got there a black cat went up to an Asian tourist and started rubbing up against her, but I couldn’t get it to pay any attention to me. We went into some lace stores, where again the people follow you around. The island was very pretty, filled with colorful houses like I saw in the photos. They were looking a little dull from the winter weather, though, and it was very foggy out. It’s a cute island, but there’s nothing to do there besides walk around and buy lace. We got some pastries from a bakery, and they were okay but nothing special. 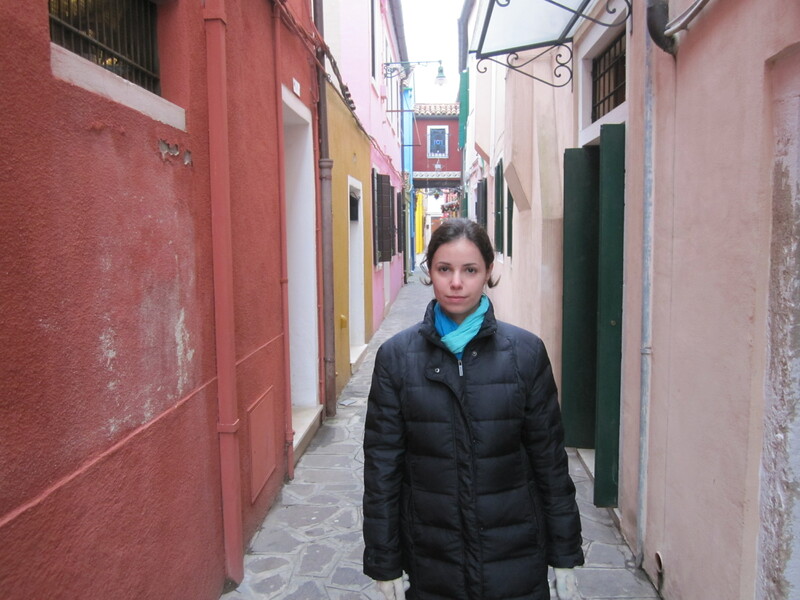 It was getting too cold and dark out to go to Torcello, so we decided it wasn’t worth it. We decided to go back to Venice for dinner since the restaurants here were very expensive. For dinner Rob found an Osteria that was listed in Fodor’s, but it was the worst meal we had in Venice. I got a nice bean soup and a main dish thinking it was veal cutlet, but it turned out to be calf liver so I could barely eat it. Rob got tiny sea scallops and some ravioli. The portions were tiny and it cost a small fortune. Afterwards we took a vaporetto under the Rialto and through the Grand Canal towards our hotel, since we still had the day pass. It was very beautiful. Fifth Day: The next day we walked to the Rialto and saw the fish and produce market. I think the fish market was closing up already because it seemed pretty small. At some point Rob got a slice of pizza (I think pizza by the slice is a new concept there) that was very good. 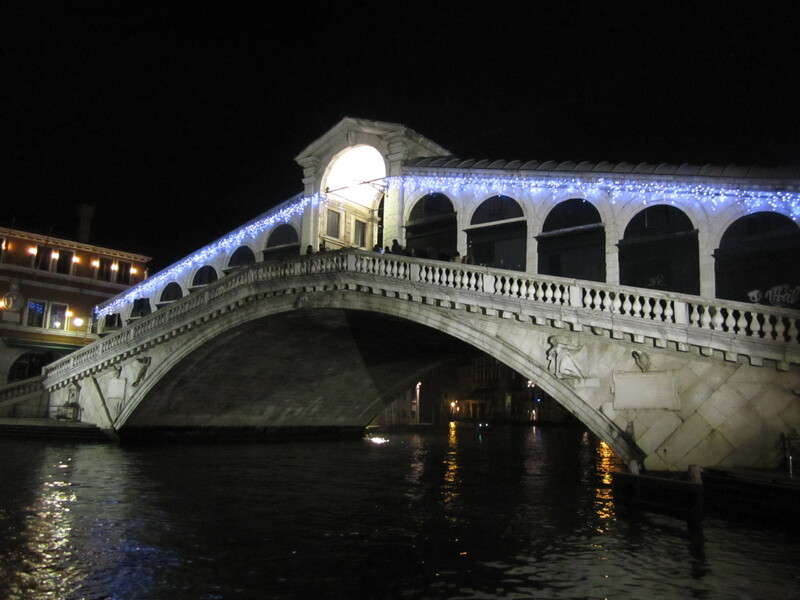 We walked over the Rialto and I drove him crazy trying to find my piece of glass. I found a small picture frame I liked on the bridge that was 69 euros, but then I went to a store right off the Rialto and found a larger frame for 49 euros. I had Rob get me that one for my Christmas/ Hanukah gift. After this we were going to go to the Naval History Museum by vaporetto, since it’s pretty far, but someone told us that they were on strike! So we had to skip the naval museum and walk to the Doge’s Palace. We spent quite a long time in there, and on the way out I saw the statues of the Tetrarchs, which I don’t think I had noticed last time. That was pretty exciting. We were going to take the vaporetto back to our hotel and then catch a train, but we hadn’t realized that the strike was still on, at least for the vaporetto we needed to take. There were no signs. So we had to practically run back to the hotel in a panic – luckily Rob had learned his way around pretty well and we didn’t get lost. We grabbed our suitcases and ran to the train station just in time to catch the train to Milan. There were 1 or 2 more that night, but they got in very late. The train ride was comfortable and passed towns I wish I could have stopped at – like Padua, etc. The central train station in Milan is huge, with ceilings higher than Grand Central Station. We found our hotel (Best Western Felice Casati) pretty easily and were immediately struck by how ugly and dark the streets were. The hotel room was such a stark contrast from our room in Venice. It was ugly and plain, without even a picture on the wall. There were portraits in the corridors, though. After settling in we went to a local pizza place and had personal pie pizzas, which were pretty good. Sixth Day: The breakfast at our hotel was much bigger than in Venice, with hot food too. 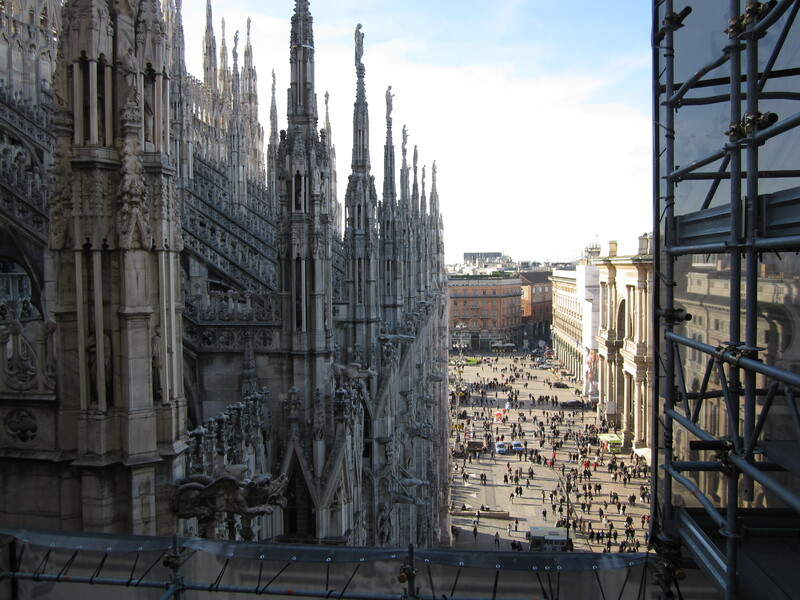 We set out for the Duomo and confirmed that Milan is very ugly. We were surprised that a city with so much wealth and such a strong artistic tradition could have become so ugly. The Duomo, of course, is gorgeous, though it’s surrounded by shopping. The outside is much prettier than the dark inside. Even better is the roof, which has a forest of spires with statues. You can see the Alps from there. We then went to the Galleria Vittorio Emanuele II, which we didn’t find too interesting. Then to the Scala, which has a very plain exterior. Of course we couldn’t see an opera because you had to buy tickets months in advance (same for The Last Supper), but we went into the museum and into a box where you can see the inside of the theater. The museum was pretty interesting, with Verdi’s death mask and items found in his pocket when he died. We walked around the city some more and saw some medieval buildings, which looked out of place. We walked down a huge shopping street that was so crowded we could barely move. I liked how it had some beautiful churches in the middle of that madness. For example, the beautiful little Renaissance church San Satiro, which has a Bramante façade and a trompe l’oeil in the apse. 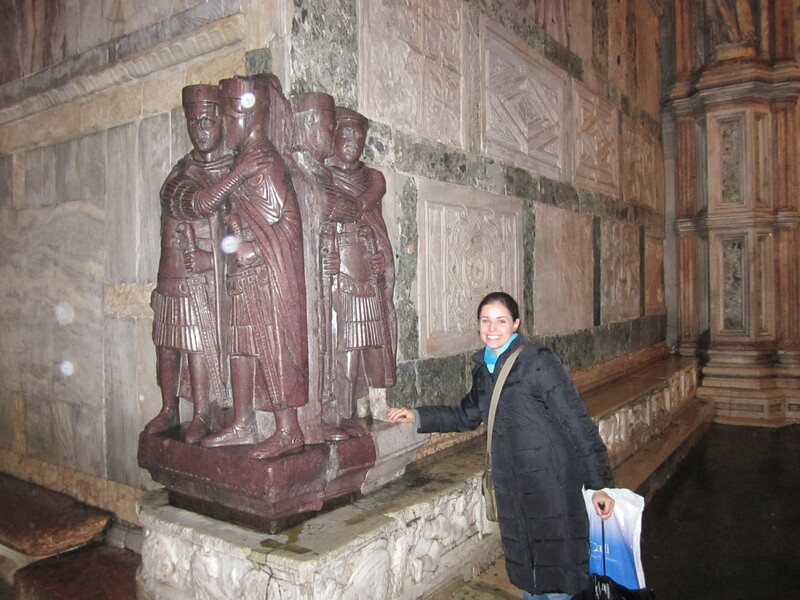 My goal was to get to the Basilica Sant’Ambrogio before it closed, which we did. I was very impressed by this one. It had a lot of interesting art inside, as well as being historically and architecturally important. 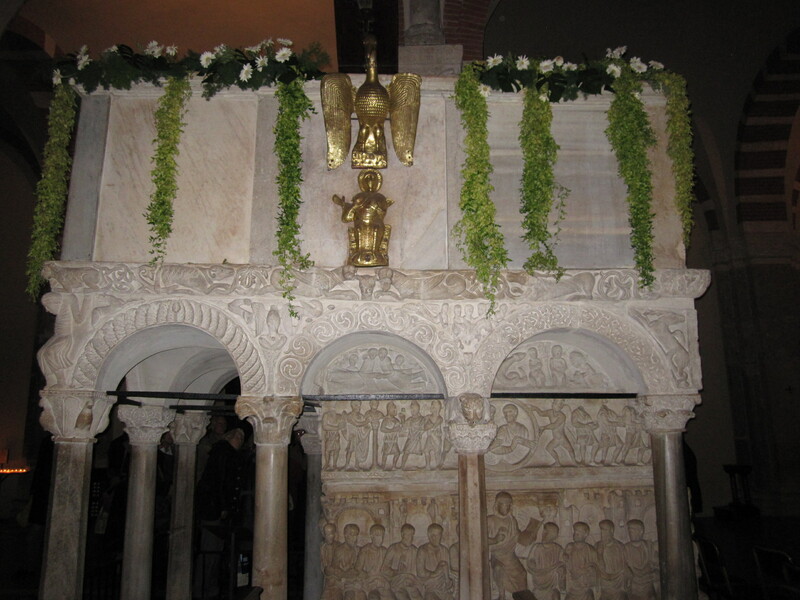 The 12th-century ambo over the 4th-century sarcophagus, with 8th-century (?) metalwork, was quite unique. I paid a small fee to see the chapel with the original Late Antique mosaics. After this I made Rob go with me to Santa Maria delle Grazie, where we walked through a nice cloister and the church itself. Of course we couldn’t get tickets to see the Last Supper. After this we took the train back to our hotel and then went to find a restaurant. We chose a Neapolitan place, because it seemed popular. It was very good. I got an appetizer of fried things (cheese, dough, etc.) and a huge calzone that was half cheese and tomato and half cheese and ham. It looked like a face. Rob got some clams that even I liked, and some homemade pasta in a creamy tomato sauce. Seventh Day: Went to the airport in Milan and flew into Newark with no problem. The flight was so empty that I was able to take over a row with three seats and go to sleep. One of the best flights I’ve had.